In May 1852, Mary Ann Cleaveland receives a letter from her son James, a whaling captain on his way home to Martha's Vineyard from a several-year whaling voyage in the Pacific. His imminent return is good news. That he is bringing home a wife most emphatically is not. Thus begins Dionis Coffin Riggs's 1940 novel based on the life of her grandmother, Mary Carlin Cleaveland. Dionis (1898–1997), a much-published poet, is the model for Victoria Trumbull, the poet-sleuth in daughter Cynthia's celebrated Martha's Vineyard Mystery Series. Mary Carlin Cleaveland, in other words, is novelist Cynthia's great-grandmother. The second facsimile edition of the 1940 original features a stunning cover by artist Elizabeth R. Whelan, whose work also graces the cover of Cynthia Riggs's Murder on C-Dock. The first facsimile edition was published in 1992 to glowing reviews. Those who know Martha's Vineyard only as a summer resort may still be able to picture it as a whaling center whose busy ports used to be swarming with activity. Vessels cleared from Edgartown and Holmes's Hole for foreign lands—or for no land at all—just whaling for four or five years. Drays bearing supplies and casks of water rumbled along the well-worn streets. Above the houses tall masts stood up with their rigging outlined against the sky. Laboring men worked late, and sailors led a merry life in port. . . . Most of the women stayed at home to bear children a Cape Horn voyage apart. They'd knit, and talk, and watch for letters—and worry whenever the wind blew loudly and the surf moaned against the South Shore. But Grandmother, coming "from off island," was different. 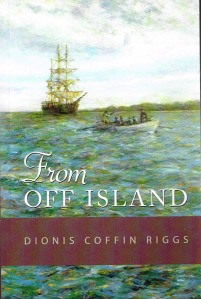 From Off Island is available in Martha's Vineyard bookstores and by mail order via this website.